As well as being the first nobleman in England to be hanged, drawn and quartered, Dafydd was also the last native Prince of Wales. Born on 11 July 1238, he was the son of Llewelyn ap Gruffydd. For several years Dafydd fought alongside the English King Edward I against his elder brother Llywelyn ap Gruffydd. Eventually he turned against the King and, on the death of his brother on 11 December 1282, he styled himself “Prince of Wales and Lord of Snowdon” and assumed leadership of the Welsh fight against Edward. After Dafydd’s inevitable capture, on 22 June 1283, his punishment was specifically devised to be harsher than any previous form of capital punishment with the intention of eliminating further Welsh resistance. Edward had already had Dafydd’s young sons incarcerated for life in Bristol Castle and his daughters sent to a nunnery in England, and now summoned all the English nobles to Shrewsbury for the trial of “the last survivor of a family of traitors”. Before a court overseen by John de Vaux, Dafydd was sentenced to death for treason. 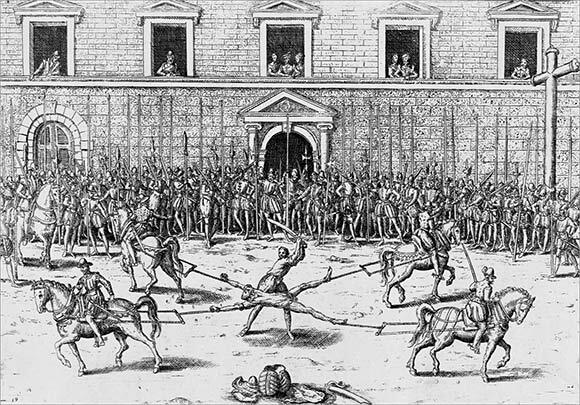 The punishment was meted out in four stages: he was dragged through the streets of Shrewsbury to the scaffold; he was hanged for the murder of Fulk Trigald and others; he was disembowelled and his entrails burnt because the murders had been committed during the Lord’s passion; and finally, for plotting the king’s death, he was beheaded and his body was quartered. Geoffrey of Shrewsbury was paid 20 shillings to perform the ghastly ritual. Dafydd’s body parts were sent to four English cities for display while his head joined that of his brother, Llywelyn, on top of the Tower of London, where the skulls were still visible many years later. The final insult was that in 1301 Edward invested his own son, Edward II, with the title Prince of Wales.